I love Chicago there are so many things to do, but trying to do them all can quickly add up. Especially if you plan a visit downtown because parking there does not come cheap and if there is any kind of convention or sports event than parking rates are very high. So when I heard there was a free day, which fell on a Saturday, to visit the John G. Shedd Aquarium well, it was time to take advantage. I decided there was no better time to go for a visit; it was free for all Illinois residents plus I hadn’t been there in years. Usually free days consist of weekdays, so I knew that if it were a Saturday it would most likely be crowded. But I was hoping I was wrong because of the cold weather we where having and it would be colder especially around the lakefront. I guess everyone else also wanted to take advantage of the free day on Saturday because when I got there, there was a long line & yes it was extremely cold. The line to get in was approximately 1hour & 45 minutes, of just waiting in the cold plus the wind just made it unbearable, the only consolation was that there was a tent close to the aquarium but it would take about an hour to reach it. The good thing is that I was prepared; I wore enough layers of clothing to somewhat keep me warm. The free day consisted of only the basic exhibits, which mainly keep you on the first floor, but it was well worth the wait especially since I had not been there in years. I decided that because most of my time was spent waiting to get in that it wasn’t worth it at that time to pay for any other exhibits especially since it was so packed. But I will definitely be planning another visit, especially with all of the exhibits they have: Penguin Encounter, Jellies, Aquatic Show and many more. 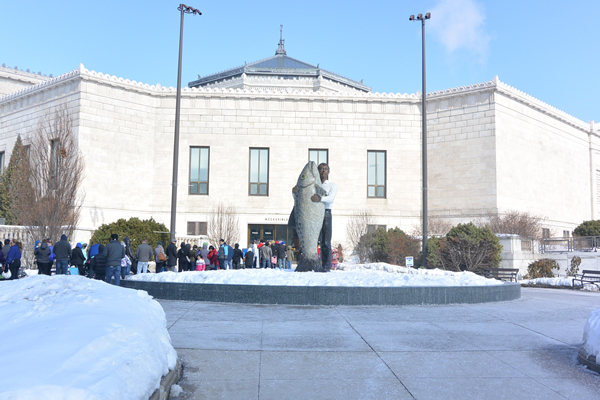 The John G. Shedd Aquarium, which opened in 1930, today is home to more than 32,600 aquatic animals representing some 1,500 species of fish, reptiles, amphibians, invertebrates, birds and mammals from waters around the world. 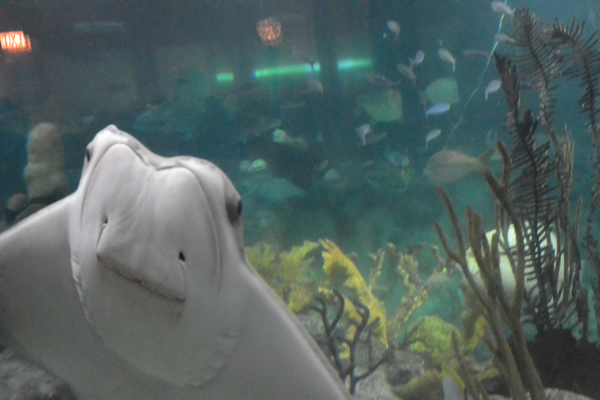 The oceanarium houses beluga whales, dolphins, sea otters, sea lions and penguins. 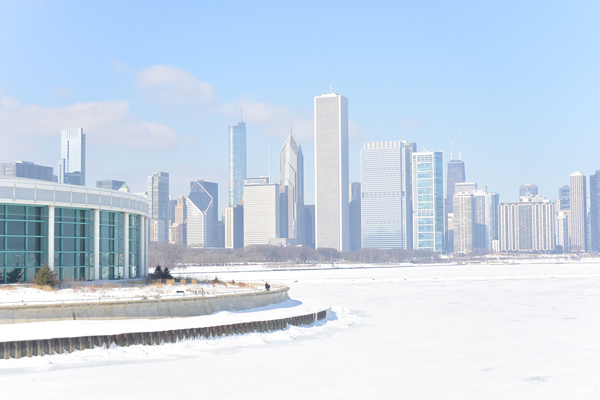 View of the Shedd Aquarium, the frozen Lake Michigan and a Downtown Chicago view. 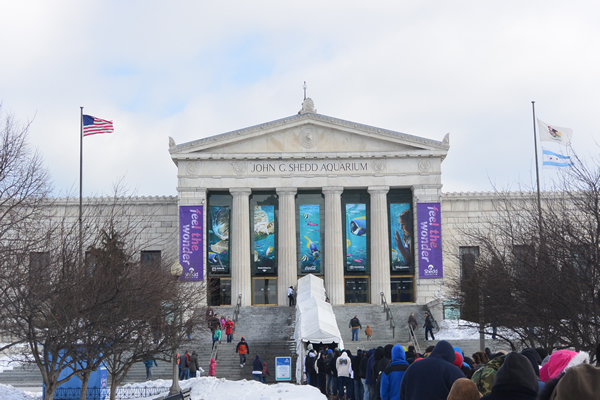 This world-class aquarium, the largest in the world, sits in the center of the Museum Campus at the edge of Lake Michigan. The tent I couldn’t wait to reach. Man with Fish Fountain at the entrance of the Museum This fountain and sculpture by Stephan Balkenhol was installed outside the Shedd Aquarium in 2001. Is there such a thing as expired makeup, well most people I speak with seem to believe “No”. It’s not like food where you can just take a look at the label or smell it to know whether to throw it out or not. With makeup it’s really difficult to know, how many of us really remember when we bought it or for that matter when the seal was removed. We throw out our makeup when the bottle is empty or we can no longer sharpen our pencils. We keep our makeup for years and if you’re like me, who owns one of those 100-color eyeshadow palettes but stick with the same 5 colors, it doesn’t make sense to throw it out especially knowing that one day you might need the turquoise one. 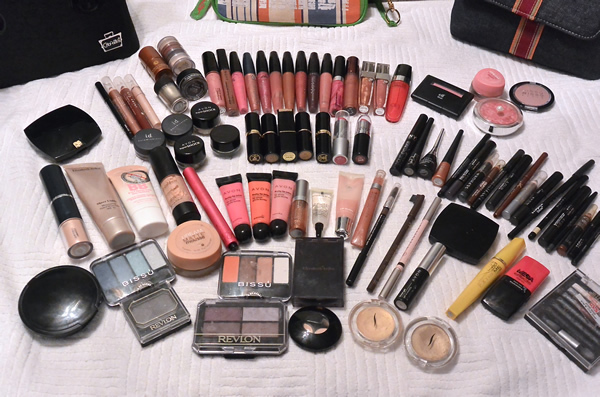 I, like many women have multiple makeup bags, in my purse for touch-ups, the bathroom drawer, my makeup drawer and one I can never find until I’m looking for something else. The fact of the matter is that makeup does have a shelf life. But not many of us know exactly when that is. I mean makeup can get pretty expensive especially if you only use name brand, so it’s really difficult to just throw it out. We rarely follow the guidelines of when an item is no longer safe to use. I have always been concerned with what I put on my eyes that is the reason I do not share my eye makeup, I’m so scared to get any kind of eye infection. 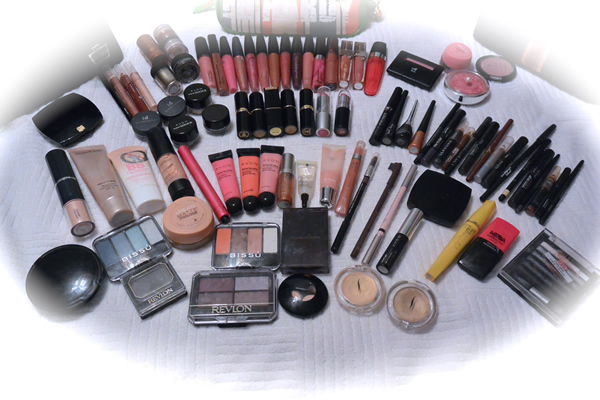 I started to look into makeup’s shelf life further when I attended a makeup show at a department store. They asked if anyone shared their makeup, a couple of hands went up & they also asked if any of us have makeup for longer than a year, well most of the hands went up for that one. They stated that the more we use our mascara the more bacteria it collects & that leads to infection. If eye makeup expires what about the rest? Well I have read many articles & it seems as though everything has an expiration date its just hard for us to know when that is, because this date is not printed on the actual products, however some brands do have the date on the box. I learned that the hard way when I bought makeup at a rummage sale, the person selling it way a consultant for a makeup company. She stated that she had acquired tons of makeup from years of selling the products, I was in makeup heaven I just started buying makeup it was so reasonably priced I took advantage. To me it was a good deal it was new in box, so why not buy. Everything seemed ok, I was showing my friend my makeup haul until she said those words that changed the way I buy makeup “did you know all the makeup you bought was expired” I was in shock, that’s why they where so cheap, she stated. Well I would like to say that I threw it out immediately, but that did not actually happen, it was still new in package so I used it & threw it out after six months. So I guess the saying is true “You Get What You Pay For” never again, now even if I’m buying makeup at a drug store I still check to see if there is an expiration date, lesson learned. The other thing we should remember is to always clean our makeup brushes & if using our hands make sure they are clean. It’s that time of year again when we decide to make time to clean out our closets. To get rid of all the items we haven’t used in months, just taking up space that can be better used for something new. But when it’s all done what next! Well last time I decided I had enough items that I would just have a garage sale, get rid of some items & make some money for new ones. Well it was not as easy as that. People shopping in Garage Sales really don’t care how much you spent on an item they want it for cheap, so somehow it was not that easy for me to let my items go, I felt more attached to them. I decided to try a consignment shop but “WOW” was I in for a shock when I learned they only pay a couple of bucks for name brand items. After that I was so disappointed my clothes came back home with me & ended up in a box for months. So I started researching, I mean there had to be a better way. So obviously I looked into Ebay I mean if there are so many people on there, someone was bound to be interested in what I was selling. Well the process seems easy enough, I mean $.30 to list an item is nothing especially if you get the amount of money you’re asking for. Well what about when it begins to add up & you realize you haven’t sold anything but now you have to pay Ebay for all the items you listed. Well I have listed on EBay & Poshmark & I have learned there are positives for both & also negatives. So here is what I have learned in a year of selling on both sites. 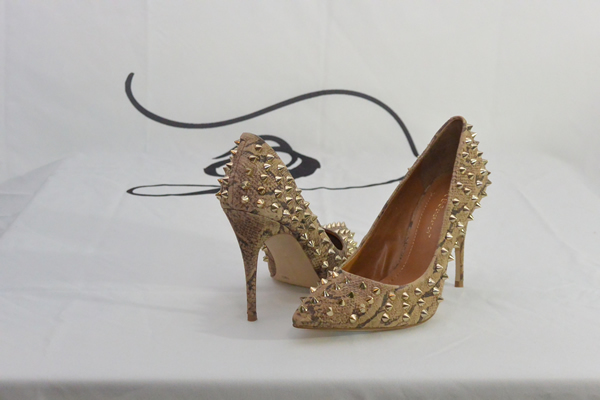 When you list an item it will be there for as many days as you have chosen then you will need to relist it. You will need to attend Posh Parties I had no idea what this was, it just means that you can share items that match the party guidelines. For instance if there is a Coach party you can share any Coach items you are selling or if it’s Dresses than any Dress any brand can be shared. There are 3 Posh Parties Daily that only last 2 hours.